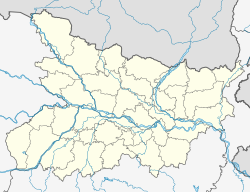 Maner also spelled Maner or Maner Sharif, is a satellite town in Patna Metropolitan Region, in the Patna district in the Indian state of Bihar. Maner Sharif lies 24 km west of Patna the capital of Bihar on National Highway 30 (India). The town has tombs of Sufi saints Makhdoom Yahya Maneri and Makhdoom Shah Daulat, known as Bari Dargah (the great shrine) and Chhoti Dargah (the small shrine). Maner is an important tourist areas and tourism centre . The city's name is said to come from its status as a center of tourism. Makhdoom Shah Daulat died in Maner Sharif in 1608 and Ibrahim Khan Governor of Bihar, built a mausoleum to him that was completed in 1616. The domed mausoleum's walls are adorned with intricate designs and its ceiling has passages from the Qur'an. Maner Sharif also has a mosque constructed by Ibrahim Khan (governor of Bihar) in 1619.Maner Sharif was a regional centre of learning and is where the Sanskrit grammarian Pāṇini studied. Maner is known for its variant of laddu made with ghee and promoted by local vendors as being made using the sugar-sweet waters of the Sone river. Maner laddu featured in the Bollywood movie Khudgarz. In addition of Maner's laddu and Dargah sharif, Maner also have Buddhist temple, Jain temple and significances of the other religion, hence, it is embelm of unity diversity. As of 2011[update] India census, Maner had a population of 2,99,585, consisting of 53% male and 47% female citizens. Maner has an average literacy rate of 52%, lower than the national average of 59.5%: male literacy is 61%, and female literacy is 42%. In Maner, 19% of the population is under 6 years of age. Srikant Nirala of RJD won the Maner seat (assembly constituency no. 192) defeating Sacchidanand Rai of JD(U) in October 2005 and February 2005. Bhai Birendra of SAP defeated Srikant Nirala of RJD in 2000. Srikant Nirala representing Janata Dal defeated Bhai Birendra (Independent) in 1995. Srikant Nirala representing Congress defeated Suryadeo Tyagi of Janata Dal in 1990. Rajmati devi representing Congress defeated Suryadeo Tyagi representing LKD in 1985. Ram Nagina Singh (Independent) defeated Suryadeo Tyagi of Janata Party (SC) in 1980. Suryadeo Tyagi representing Janata Party defeated Ram Nagina Singh representing Congress in 1977. Currently, Bhai Birendra of RJD serving as the MLA of Maner constituency. Maner assembly constituency is part of Pataliputra (Lok Sabha constituency). 187 Maner assembly constituency covers Maner community development block; and Aanandpur, Kateshar, Sikandarpur, Parev, Daulatpur Simri, Mushepur, Shri Rampur, Bihta, Dayalpur Daulatpur, Purshottampur Painathi, Bishunpura, Raghopur, Amhara, Kanchanpur Kharagpur, Sadisopur, Painal, Bela, Neora, Makhdoompur and Shri Chandpur gram panchayats of Bihta CD Block. ^ "192 - Maner Assembly Constituency". Partywise Comparison Since 1977. Election Commission of India. Archived from the original on 10 April 2009. Retrieved 5 June 2009. ^ "General Election 2009 Assembly constituencies". Pataliputra. India elections.co.in. Retrieved 20 May 2009. ^ "Order No. 48, 2007" (PDF). Delimitation Commission of India. Retrieved 4 May 2010. This page was last edited on 9 April 2019, at 10:30 (UTC).